Word from the talk shows and on the web suggests that the new Coen Brothers’ film True Grit (2010) was not a remake of the classic John Wayne western True Grit (1969), but a new, more faithful interpretation of the original novel, True Grit (1968) by Charles Portis. As Mattie Ross might say, “That is a big story.” This past week I read the original novel and then watched both movies. In terms of following the book scene by scene I’d say the John Wayne film was more faithful to the book. But the Jeff Bridges version follows the book’s ending much closer. Both films used extensive amounts of dialog lifted directly from the novel. But yes, the newer film was more grittier when it came to the violence and humor of the story. The motion picture stands at the pinnacle of all art forms in our culture – where millions will flock to see the latest blockbuster. But what role does the novel play in creating this art form? Movies are often created directly from screenplays, so it’s hard to measure their worth without the novel, but when one is made from a great novel, how do we judge its success? As a standalone work of art, or as an interpretation of another work? In my mind, neither the 1969 or 2010 film versions of True Grit came close to the power of the Charles Portis novel. But as standalone works of art I think they are equally successful in their own ways. The cinematic culture that made each film is very different, as well as the culture of their separate audiences. They are like night and day, but then so is 1969 and 2010. The 1969 film can be considered the clean version of the story, with all the actors wearing clean and colorful costumes, filmed in the gorgeous Colorado Rockies. The 2010 film is far more realist and historically accurate, especially to the setting of the novel, Arkansas and the Oklahoma Indian territories – but filmed in Texas and closer to the look of the land in the book. The 2010 film visually portrayed the wild west characters as if they had step through a time travel portal, looking dirty, hungry and uneducated. But all modern film westerns do this, it’s the style of the time, so I don’t know if we can give credit to the Coen Brothers for being more faithful to the book. I can’t recommend reading the novel highly enough – both films fail to capture much of the story, although because it’s a short book with vivid dialog, both do follow it faithfully far better than Hollywood usually follows an original novel. The novel is dense with fictional details that just don’t come out in the movies. Also, the novel is all about the voice of Mattie Ross, and neither movie captures that. Movie makers consider voice over narration the kiss of death, but I wish they could have put more of book Mattie’s thinking into movie Mattie’s performance. And strangely Portis sense of the dramatic appears superior to each set of movie makers because when each film diverts from his plotting and scene setup they suffer. Portis had a keen sense of plotting and drama that both films wisely copy fairly thoroughly. The oddest departure from the story is the casting of actors for Rooster Cogburn. Jeff Bridges was 61 and John Wayne was around 62, whereas in the book Rooster is described as being in his forties. Kim Darby was around 21 when cast as the 14 year old Mattie Ross, which gives Hailee Steinfield an edge since she was 13. 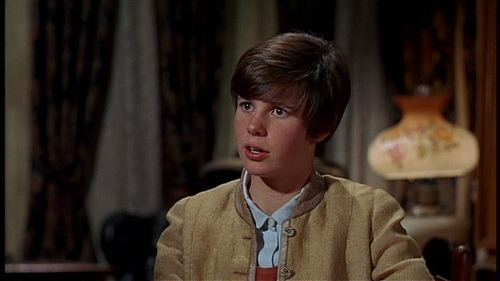 Too me Kim Darby in her film often looked younger than Hailee Steinfield because they were trying to make her look younger to play the part, while the Coen Brothers seemed to be trying to make Hailee look more stern and mature to be believable. Overall the acting is superior in the newer film, but there are some good performances in the older one. I actually prefer John Wayne’s performance because he’s more charming and likable, but Portis goes a long way to make Rooster unlikable letting us know that he abandoned his family, robbed banks, road with Quantrill’s terrorists, and even though he works for the law is seldom legal in his actions. And the book provides the extremely realistic coda that Rooster never tried to contact Mattie after their adventure was over ,implying that Mattie meant little to him, but to Mattie, Rooster was someone she remembered her whole life. Rooster had few warm and fuzzy qualities, even though the movies lead us to feel he did. And book Mattie was a cold character who ended up only loving her religion and bank and never marrying. In the end, I think both movies lean closer to being sentimental where the book tries to warn us against that. Bookworms always protest how their favorite novels are made into bad films, and I’d have to say neither version of True Grit has come close to capturing the true beauty of the book. True Grit (2010) runs 110 minutes and if they had pushed that time to even 140 minutes I think they could have come damn close. True Grit (1969) ran 128 minutes and filmed more scenes from the book but captured less of the true grit of the story. What’s needed is 5 minutes of Mattie opening the story from 1928, the vantage point of her narration, and another few minutes closing it. I’m not fond of framing novels and movies with action outside of the story, but that’s how Charles Portis wrote it, and I think it’s needed to capture the voice of Mattie. The older Mattie even intrudes within the story from time to time. Also, the 2010 version should have followed all the scenes Portis wrote set in the Indian territories, and fixed La Beouf’s plotline. Twice Matt Damon left their little posse for no real reason – did he have other commitments? Ultimately both movies work hard to follow the book, but I think the people of 2010 are naturally more willing to accept the horror and grotesque of the American gothic of the story. Are citizens of 2010 closer psychologically to their 1877 cousins? What doesn’t come across in either film are the threads of religion that run through the book. True Grit isn’t Christian but deeply Old Testament. The world of True Grit missed the Enlightenment. It is why it’s a great western. 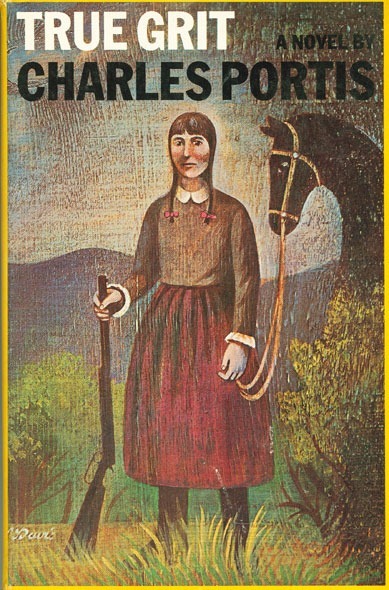 Jane Tompkins makes a great case that the western is anti-Christian and anti-woman in her book West of Everything, and I think True Grit fits her thesis. Mattie Ross is a Christian woman who leaves civilization and for a few days explores the heart of darkness of the old west. I’m almost always disappointed when they make a book I like into a movie, but the fact is, they’re very different media. It’s the rare book that can be made into a good movie without some changes – and usually rather significant changes. Actually, I could say the same thing about computer games, too. There are different requirements for all of these. So although the same idea might make a great book, movie, and game, they’ll still need to be considerably different. Now for me, I can take a lot more “grit” in a book than in a movie. But then, I’m not a huge movie fan, anyway. I haven’t read “True Grit,” but of course I’ve seen the John Wayne movie, and I thought it was lots of fun. And that’s all I wanted. The Spur Awards selected TRUE GRIT as one of the best westernsever written, so it is hard to imagine how a movie can live up to that level of kudos. I suspect i would more likely enjoy the novel more than either movie, as you did. Just saw the movie with Jeff Bridges – never saw the John Wayne version – and wondered how well the movie(s) compared to the book. Thanks. Does the Old Testament quotation from Proverbs (28:1) stand as an epigraph to the novel, as it does in Coen bros. movie? flight from Fort Smith after killing Mattie’s father. No, Vladimir. Not in my paperback copy, anyway. Thank you for the information itself and for quick reply. reader in the period and completely suspends disbelief. closely than does the ’69 film, I’m unaware of it. Strother Martin as STONEHILL the horse trader. Netflix, primarily because of the Coen Bros involvement. yet another big bucks repetition every other month. Thanks for your comments on the book and movies True Grit. They stimulated and deepened my own reflections on the movies, which you can find, if interested on my movie blog at http://emilysmoviecafe.blogspot.com, or by search engine, Emily’s Movie Cafe. I like your blog! True Grit is a wonderful novel. Have you tried the audio book edition Bryan. It’s another way to experience the story. I loved both movies, but neither match the voice of the book. I thought the Coen Brothers have done a marvelous job capturing Mattie’s point of view and character through her dialogue and didn’t need narration to bookend the movie to develop her character. I thought the scenes with her were wonderful. Most scenes with her would begin with the characters interacting with her underestimating her because of her gender and age, but in the end they would come away impressed or even intimidated. Others have written they were disappointed about seeing a women being punished in the end for her independence. Mattie loses her arm and ends up a spinster. Part of this is simply following the plot in the novel. But I see the lost limb and spinsterism not as the price of independence, but the price of vengeance. I’m sure when Portis wrote his novel, he was thinking more about biblical allegory than about women’s rights. For example, Mattie being bitten by the snake after killing Chaney parallels the serpent in the Garden Eden and Eve’s loss of innocence after giving into temptation. It is also in this way that ‘True Grit’ ties in with a common theme found in other Coen Brothers movies – that those who live by violence and give in to their lust for vengeance must pay a price for it – such characters don’t always pay with their lives, but they are always come away at least permanently scarred in the pursuit of vengeance. I’m glad the Coen Brothers chose to include the scene with the killing of the pony, which was also in the Portis novel. The scene signifies again Mattie’s loss of innocence. Before the killing of Chaney, Mattie was an intrepid youth, but still protected by the innocence of childhood. But once she succeeded in killing Chaney, Mattie’s innocence was forever lost (it should be noted that in the novel it’s Rooster who actually kills Chaney – I prefer that Chaney died by Mattie’s hand so that his death is clearly Mattie’s responsibility). While I enjoyed the Coen Brothers’ version of ‘True Grit’, the movie in the end still felt like a very small movie too me and one that would soon to be forgotten. Perhaps it’s because the characters were at the end of the day too cartoon-like and rather than realistic. It didn’t resonate the same way as ‘Unforgiven’. I love both movies but it’s the novel that has the real impact. I wonder if there is a novel for Unforgiven? Not having read the book, I was totally unprepared for the ending of the recent Jeff Bridges “True Grit” wherein Mattie loses an arm, becomes a woman not unlike some scary weird neighbor. Was this in the book? Did she lose her arm and retreat into cold and bitter aloneness. YIPES. Give me the John Wayne version thank you, book or no book. Could not handle the ending to the Coen Bros. movie. Yes, I believe the Coen Brothers ending was much truer to the book, but I’ve since forgotten the exact details of each. The thing I found depressing in the book that was different from the John Wayne movie, was Mattie’s love of Rooster was one way. In the book, it seems to imply that Rooster never gave her another thought, and probably never liked her during the course of the story. The John Wayne movie is downright cheery compared the the book. Mattie does go on to own a bank. In the novel, she narrates the story from her old age, from the 1920s I think. She never marries, and at one point says that people only thinks she loves her money and her Bible. The book is tremendous, and everyone should read it. Both movies are a lot of fun, but it’s the book that counts. Does anyone know where to get a free audio of this book? Try your library, and see if they have Overdrive. Overdrive is free audio books and ebooks online using your local library card. That’s interesting. I need to see Rooster Cogburn again. I love all three versions, although I think the newest movie is more realistic. It also followed the book better, but it left some stuff out. The book is just great though. I just bought Blu-ray copies of both movies.